Last weekend the incredible photo collection of Robert G. McCubbin went up for auction at Brian Lebel's Cody Old West Events auction in Mesa, Arizona. 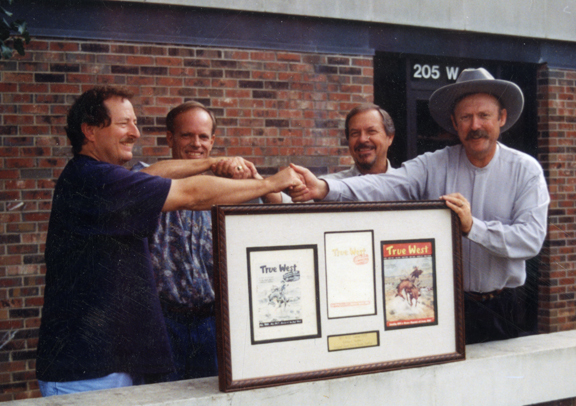 October 16, 1999: The two Steves (Steve Cundiff and Steve Gragert) sell True West magazine to the two Bobs for $60,000 and change (okay, we took on some debt of theirs and it ended up being closer to $110,000). Back to the auction: I read in the papers that attorneys for Lincoln County, New Mexico demanded 12 documents out of the collection that were related to Lincoln County, and then the State Attorney General of New Mexico demanded 30 items. All were taken out of the auction and the McCubbin family has retained a lawyer to defend the items. This just in from my contact in Lincoln County: "I have just learned that the McCubbin family has donated all the AG pulled documents to the state!! The AG is supposed to be putting out a statement on that shortly." Six of the biggest Western photo collectors in the world attended the auction and we will be running the results of their purchases in the next issue of True West magazine. It also needs to be said that Bob McCubbin was always generous with his collection and he shared virtually all of his images with True West for the past 20 years for the simple reason that he loved history and he loved to see the correct photos run, preferably large, so that everyone could see them in all their glory. Often he would ask us to take care of commercial inquiries, like tv shows who wanted to use his photos, and our production manager, Robert Ray, would send scans and collect a modest fee for Bob, for the usage rights. These fees were in the range of $50 per photo and more often than not Bob would remit the fee back to Robert Ray for his time spent finding and sending the images. Almost without exception, Bob shared his collection and was gracious to all inquiries. Last weekend the Mesa auction had an incident over a Ray Swanson painting of a Navajo. A guy named Derek Begay came in to the show room, and gave a speech in front of the painting saying it was a painting of his grandfather and the Navajos should have it, and then he took it off the wall and tried to leave. He was arrested. Begay is all over Facebook talking about the incident and demanding justice, etc. "Not only was Bob McCubbin a historian in his own right, he collected all of this for his own amusement and then he shared it with the world. You can't ask for a better legacy than that."